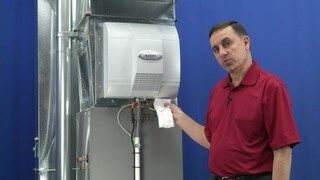 Hi, I'm Jay, and this is the Aprilaire model 700, series 2, humidifier. There's a series 1 and a series 2, we'll get into the differences a little later here. But we're going to figure out why, this particular model does not have any water coming down the drain. We have the unit turned on, and it should be running. So, no water coming down the drain, that means there's a problem. So, first thing we're going to do, is we're going to see if there's water, here in the feed line. Ok, because we do not have water pressure there, even though the water is turned on. So, we're going to disconnect this, but before we do that, we're going to have our assistant, turn the water off. Find the saddle valve, turn it clockwise, until it stops. Ok, now that the water is turned off, let's open this up and see what we have. You're going to use a 1/2 inch and a 9/16 inch wrench in order to get this apart. Let's get a bucket, and remove this line and stick it in the bucket. Alright, now let's turn the water on. Alright, as you can see, we have plenty of water pressure here. So, we're good to this point. Let's turn the water off. Alright, now, if when my assistant turned that valve on, we had no water here, the problem is the saddle valve. The saddle valves are easy to replace, just buy one from us, and replace it. Now, this particular situation, we have plenty of water here, the problem is not with the saddle valve, it's with the solenoid valve or some other situation, so let's reconnect this and continue testing. And we're going to snag it up with the wrenches. Alright, we still have the power and the water turned off, now we're going to check the outbound side of the solenoid valve to see if there's water there, but it's just not getting into the humidifier. So we're going to get back down here, and we're going to disconnect the feed tube, same wrenches. Alright, we have the feed tube disconnected, let's get out a rag. We're going to hold it on this valve. If things go right, we'll have water here, so what we're going to do is turn the water back on, and then turn the humidifier and the furnace back on, so we can get this valve to open, at least get electricity to it, and see what happens. So let's have our assistant turn the water on, then we'll turn on the furnace and the humidifier. Still nothing. Ok, so we have water on the inlet side of the solenoid valve. We have no water leaving the solenoid valve. So the only thing left is to determine if there is electricity feeding the solenoid valve. If we had water when I was holding this rag right here, when there was water squirting out of the solenoid valve, then that would show we were good up to this point on the valve. The problem then, would've been right here, on the end of this feed tube there's a tiny little orifice, it's a tiny little nylon piece, about the size of a pencil eraser, and you it can plug up over time, and sometimes they'll just erode and get to have a very large hole in them. There's a microscopic hole in this thing, and it is used to meter the amount of water that goes up to the top of the pad, so you have just enough to wet the pad, and also enough left to wash the pad, and that's what goes down the drain. If this orifice plugs up, we'll have no water going back there. If the orifice completely disintegrages, or the hole in it erodes too large, then you'll have too much water feeding up, in which case you'll have a flood of water coming down the drain. It should be trickling down the drain during normal operation. Let's get this line reconnected. Snug this back up. Now let's test the solenoid valve itself. So, turn the water back on, turn the furnace back on, and turn the humidifier back on. And we're going to check to see if we have electricity here. There's a couple of ways of doing that. One of them, is the easy way. And it involves taking a screwdriver, a non magnetic screwdriver, like this particular one here. So if I touch this to duct work, or a bolt or something, it doesn't stick to it. Ok, so it's not a magnetic style screw driver. We're going to take this and we're going to touch it to the top of the solenoid valve. Now, this is an electro magentic valve. So if it's getting electricity, and this valve is trying to open, even though it's not, then they're will be magnetic power right there on the end. We're going to take this, we're going to hold it here, and we're going to check. Ok, now it wants to stick to the top of this valve, so we do have magnetism here, which means that the valve is getting electricity. If it it were not getting power, again, we'd have nothing here. But, because it wants to stick to the top of this valve, that is proving that there is electricity to the valve, the coil is generating an electro magnetic force, and the valve should be open. This valve is not open, so we've determined that this valve is stuck internally. So the valve does need to be replaced, that's a simple job. Buy a new valve from us, stick the new valve in. Now, if we were to determine that we didn't feel any magnetic attraction here, then we want to check for voltage. We've turned off the power to our humidifer, and furnace. So now what we're going to do is the alternate method of testing this solenoid valve, to see if there's electricity feeding it. These two yellow wires that feed the solenoid valve, are sending 24 volts to it. So we're going to get out some wire cutters, cut these, one at a time, strip the ends. We're going to take about a half an inch off of each end. Let's twist the ends. Now we're going to twist them together, and reconnect them. So, here's this one. So, one from the solenoid valve, and one from the humidifier, and we're going to twist this together. Alright, now that they're reconnected, we're going to get a volt meter, attach it to this, and test for electricity. Alright, here's our volt meter, we're going to attach the probes carefully, one at a time. So we'll get that one, and the second one. Alright, so we have these connected. We're going to be careful that these are not touching the sheet metal or anything, and they're not rounded out or shorted out to each other. So these are freely hanging, now, we're going to have our assistant turn the furnace back on and the humidifier back on, to see if we have electricity here. Ok, now we have the probes connected to our wires. The humidifier is turned on, the furnace is turned on, everything should be running right now. And we do have electricity. So, as you can see, the voltage is ranging between 19 and 29 volts. That's normal. We have AC power, feeding the valve. Our solenoid valve should be open at this point. And as you can see, we have no water coming down our drain, so the valve is stuck closed, even though it is getting electricity. This is the alternate way of testing if can not use your screwdriver magnet trick on your particular model. So we have power, valve won't open. We have a bad solenoid valve. Earlier in the video, I mentioned that this was a model 700, series 2. The difference between the 700 series 1 and the series 2 is this. If you look up inside this little grill, you will find that the series 2 has a little relay in it. The series 1 units have a circuit board like this, with a relay and a transformer built on to it. Now, the power humidifiers, up until recently, all had systems like this in it, with a built in transfer and relay. Like the 110's, the 112's, 760's and 768's. They were set up like this. Now, they worked differently than this, which is the series 2. The way they worked, is since they had a built in transformer, you could take these two wires and touch them together in the old series. If you touch them together, and you had electricity coming from the humidifier, from this plug in wire. The humidifier would come on, but they did away with that, so nowadays, since they have this little relay in them, you can't touch these two wires together, because if you do, you're going to blow out something. Probably the transformer at the other end down here, inside the furnace. So it's important that you know if it's a series 1 or a series 2, when doign any kind of testing to determine if one of these two devices, which is hiding inside of this particular humidifier, is faulty. If you get into trouble, and you're trying to figure that out, you can call us for technical support and that. There's typically not problems with those two items, so it's not a real common issue, but if you run into a problem like that, where you have no electricity here, feeding the solenoid valve, and you're confused as to what to do next, you can give us a call and we'll walk you through it. The other thing that I have not mentioned earlier, is to make sure that this cord, is plugged into a live outlet. Easy button for that, is to go to that outlet, unplug the humidifier, and plug something in like a lamp or a radio, just to see if that thing comes on, just to make sure, 100 percent posititve, that you do have power going to this socket that this thing is plugged in to. So, on this particular one, we've determined that there's an issue here. And we're going to test about regarding the voltage here, so in the case where you had no voltage here, feeding the solenoid valve, there was another kind of a test that you could do. And that is to listen to the fan inside of this thing to see if it runs. So, if you listen real carefully, and you turn this unit on, now you can't really see the fan inside of here spinning, but if you listen very carefully while the furnace is running, and you have an assistant turning the humidistat up and down, up and down, up and down, and the humidistat is clicking on and off, on and off, often times you can listen and hear inside of this thing, you can hear the humidifier itself making a little clicking noise. And also sometimes you can hear the fan, depending on how quiet your furnace is, you can actually hear the fan inside of here spinning. So that's another way to determine that the humidistat and everything else is working up to this point, and once you know all that's working, and you still don't have a solenoid valve, opening and closing, even though you may not have a way to test this. You don't have a volt meter to test this with. But if you know the fan inside this thing is coming on and off on and off on and off, with the humidistat, well then you know you have power here, and the real problem is the solenoid valve.